With our basement staircase installation cost guide you will access all cost information as well as instruction on building any type of basement staircases. You have a nice house or building with “extra space below” – the basement – which you wish to make good use of. Naturally, you need access to this space, which requires you to have a staircase leading down to that basement. Perhaps the existing staircase is worn out and needs refurbishing or total replacement. The basement has many uses, depending on whether the building is a public one or a private home. For the private home, which is what we are interested in here, the basement can be used for a functional use such as garage, store room, cold room, gym, children’s play room, or even a spare bedroom. Some homes may turn the basement into a luxury space for a bar, home theater, laundry, secret chamber, or an art studio/exhibition. The functional use basement will likely have a functional staircase devoid of aesthetics and expensive options. The luxury space use will most probably include a well-designed and expensive staircase to match. Before you construct the staircase, you have to bear in mind several factors such as safety, functionality, aesthetics, what the basement will be used for, who will use it, how often it will be used, and whether you are building a new staircase, rebuilding or redesigning an existing staircase, or repairing an old staircase. But the biggest question when building the basement staircase for most people is the cost of building it. Basement stairs do not usually have much of aesthetics and luxuries attached to them. They are designed with safety in mind and therefore have sturdy railings with good grip, and rough, anti-slip stairs. The finishing is often plain, with rubber-covered railing, and without a carpet on the stairs. Basement stairs are therefore significantly cheaper to build than the main house stairs, estimated at between $900 and $1500. Many estimates place the cost of installing staircases at between $1000 and $3200 or a national average of $2020, but there are estimates as low as $400 for DIY and as high as $5000 for a professional job. Wood is the most popular material in basement staircase construction. It is cheaper, easily available, easy to work with, and easy to shape and create interesting designs. Red oak is particularly preferred because it is durable, affordable and beautiful. Metal stairs are not very common except when constructing spiral staircases. Perhaps you are a DIY savvy or short on cash, and would rather do the design and construction yourself. This is alright, but before you decide on the DIY undertaking, you might want to consider a few facts: Do you know how to construct? What materials do you intend to use, do you have the tools to enable you to build the stairs? For example do you have the carpentry tools for constructing a wooden staircase, do you have the drills, metal cutters, and welding equipment for constructing a metallic staircase? A staircase is a safety-critical part of the house. You must think safety first in your design. You don’t want a member of the family getting a nasty accident on account of poor workmanship, or the prospects of a guest suing you for injury occasioned by your unsafe staircase. You therefore must create a safe basement staircase. 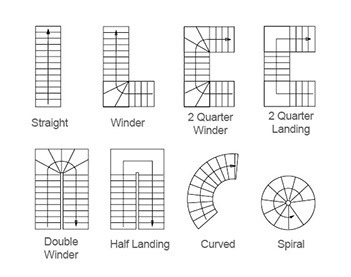 You need to first familiarize yourself with a few staircase terminologies. Tread is the horizontal board on which you step. It should be wide enough for a large foot. Riser is the vertical board above and below the tread. The tread and riser form a stair. The ratio of tread to riser should be about 7 to 17. Stringer is the long plank on which the stairs are built. The newel is the main support post at the landing of the stairs. The minor support and safety pillars are the balusters. The rail is the lower support for balusters, which fixes and supports the balusters. The handrail is the upper beam that supports the balusters and acts as the safety support when walking the stairs. 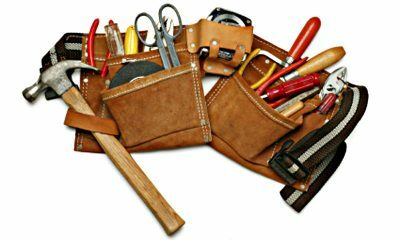 As a DIY you will have to take many measurements and have a number of essential tools and materials like a circular saw, a hand saw, an electric drill and screw driver, a hammer, a speed square, tape measure, different sized nails and screws, wood glue, primer and paint, and a step ladder. What Determines the Cost of Building a Basement Staircase? A combination of these factors will determine the final price, but estimates from different sources place the cost at anywhere between $400 for a rustic DIY staircase, to $7000 for a fine piece of artwork. The conventional staircase would be a functional one costing approximately $2000. We will give a breakdown of the main costs later on. You have to decide at the outset if you are going to replace an old staircase or refurbish it. For older houses it is usually better to replace the entire staircase because the existing one was designed for a different error when basements were used for other functions. Moreover, older stairs into basements were narrow and very basic. If the stringers are weak and rotting then the entire staircase has to be replaced, otherwise you can be replacing only the treads and balusters. If the new staircase is to be built from scratch in an existing building, then the old staircase may have to be demolished first. This will involve partial demolition of the supporting wall where the staircase is joined to the wall. You do not wish to cause much damage to the wall or surrounding structures, and therefore you need to take time on the task of demolition. Usually, you want to engage the services of a professional to do or to help in the demolition. Improve Net puts the cost of demolition by a professional contractor at $2000. You will also incur charges for disposal of debris and filling and repainting the damaged portion of the wall. There are different types of staircases, the choice being determined by factors such as the space available for the stairs, the need for an aesthetically appealing staircase, the amount of material used in building the staircase, and the complexity and functionality of the staircase. Functional staircases for a basement are such as the straight and spiral, which are also relatively cheap and easy to build either by a contractor or by yourself. The straight staircase runs straight from the ground floor landing to the basement landing. It also creates room beneath the upper part of the staircase for building a storage area or a bar. The spiral staircase runs vertically down but in spiral manner, thus saving on space. It also takes up less material and can be bought and transported cheaply as a prefabricated unit. More complex and often aesthetically appealing staircases include the L-shaped, winded L-shaped, return or U-shaped, circular, helical, and a combination of shapes. These complex staircases are most appropriate where there is space and there is much need for privacy. However, circular and helical shaped staircases are complex and usually unsuitable for a basement as they require more open space above them. On the upside, they use less material to construct because often they are built without the risers. Like the straight shaped, the L-shaped, U-shaped, and winded L-shaped staircases have room beneath the upper part of the staircase for building a facility like bar or storage. L-shaped staircases are simple to construct and can make use of the space beneath the staircase. They however require a lot of planning, materials and time to put up. You will likely need a contractor to do the building. Although L-shaped staircases are stylish, affordable and give a level of privacy to the people in the upper floor, they are not suited to basements because they occupy much room. They are relatively safe because in the event of an accidental fall, the victim does not roll the full length of the stairs. The straight staircase a common choice for basement staircase because it simple in design and it relatively easy to build. Many prefabricated straight staircases use wood for treads, risers, balusters, and handrails, but some staircases use a combination of wood and metal for strength. Some staircase designs are not common in basement. For example the circular staircase, which is difficult to construct because it lacks a central post, also occupies much space. It takes up much space, making it unsuitable for the design of a basement staircase. Return or U-shaped staircases make a 180 degree turn which gives security and privacy just like the L-shaped staircase. However it also occupies much-needed space in the basement. It also tends to be dark in the part that is sheltered from sunlight. It is expensive and complicated to construct. Spiral staircases, which are built around a central pole, take up the least amount of space and are cost effective, but they are more difficult to navigate and nearly impossible for moving large objects. They are also the least safe as they are steep sloping. They are usually built with metal. They are ideal for basement and attic access (besides serving as alternative access to different floor levels). Helical are similar to spiral staircases but with no central pole, have a wider diameter, and handrails on both sides. A ready-to install steel spiral kit staircase cost between $400 and $1500, while its wood and metal version costs between $1500 and $5000. The fully assembled spiral staircase is quite popular because of its simple but elegant design, ease of fabrication, lightweight to transport and easy to mount into place. Many spiral staircases are built from steel, which is heavier and cheaper, and aluminum, which is lighter and expensive. Metal is advantageous in fabricating staircases because all sections of the staircase are welded together, galvanized, primed and painted into a single unit or a few sections. Galvanization is done by dipping the metal frame in hot molten zinc. Galvanization also fills any cracks and holes, thus protecting them from rust and moisture. Staircase kits are made for ease of transportation where a fully assembled unit would be too large and heavy to carry. A kit contains two or three sections that are reassembled at the site of the basement staircase. Knocked down staircase kits take more time and require extra hands to mount, which translates to a significant increase in the cost of installation. At Paragon, DIY kits start at $540 for a 3½ by 7 foot steel spiral staircase. Balusters and handrails are sold separately for another $400 to $2000. The spiral staircase kits from Salter Spiral Stair go for between $600 and $20,000 and as high as $100,000. They use AutoCAD to recreate your space and fit in the stairs, which ensures your staircase fits in the space. They also design custom-made staircases. Solid wood spiral stairs are more expensive because they use durable wood and can be designed into attractive shapes and patterns. To many homeowners, the basement is a functional space, devoid of luxuries like padding and aesthetics like painting. You have a choice between buying materials and buying a ready-made staircase, which comes as either a fully assembled staircase or a knocked down kit. The price of the kits is usually separate from the price of rails and handrails.. According to Improve Net, the focus of construction is function, and the cost of a complete spiral staircase hovers around $1400, which is about half the cost of the main staircase. As a general rule, fully assembled staircases are the most expensive to buy. Since they are mass produced, they may not necessarily fit in your basement design and you may have to modify either the unit or the basement space in order to install properly. They are also more difficult and expensive to transport, sometimes requiring the service of a forklift, a crane or some other heavy duty lifting equipment in order to lower the staircase down the basement and position it in its final site. The main advantages of factory-built stairs are that they are sturdier since they have fewer joints that may easily rust, they are quick to install, and they cost less in labor. Since they require minimal installation work, prefabricated staircases can be easily installed by a DIY type of house owner. Knocked down kits, which are delivered in sections, are easier to transport but take more labor and time to install. A custom-made unit from either Stair Systems or Visador costs between $1000 and $2000. They also manufacture wooden newel posts, railings, and balusters that are height adjustable to suit your needs. Although the cost of pre-assembled and knocked down kit staircases is higher, when labor and time costs are factored in, the cost saving of buying and transporting materials is offset by the increase in labor cost. Mylen manufactures fully assembled steel stair systems at the introductory price of $1200. 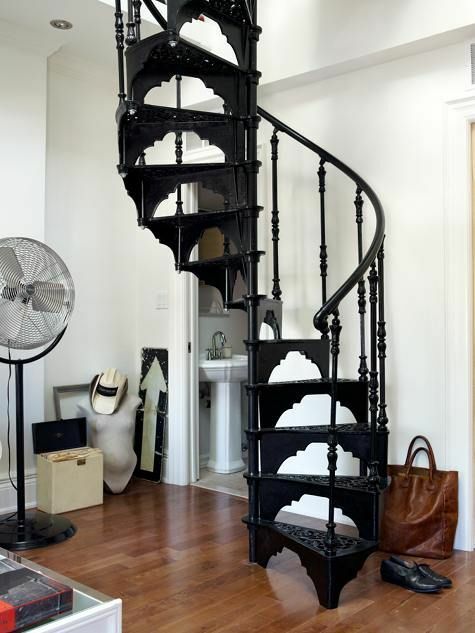 The steel spiral kit staircase with simple stocks and baseboards costs approximately $250 and $400 for the stock, and $400 to $1500 for the rest of the kit. Steel kits are the least expensive and wooden kits are the most the most. The kits are usually either primed or stained. Arcways spiral staircases cost in the $3000 range for both metal and wood designs. The primed steel, straight staircase kit from Paragon Stairs, start at a basic price of $600 to $900 for a simple 3foot wide staircase. The rails cost a further $400 to $1200. Arcways manufacture a range of straight staircases in the range of $5100. The complexity of the staircase and accessibility of your basement will help determine if you can do it yourself or if you need extra hands, and how much time it would take to accomplish the task. Building a staircase from raw materials is the cheapest option on materials and transport charges, but labor costs increase significantly. The materials of choice for basement stairs are wood, concrete, metal, and stone. Improve Net estimates the various costs per step as follows: wood at $36 to $50, metal at $195, stone $150, and concrete at $300. A typical staircase has about 15 steps. 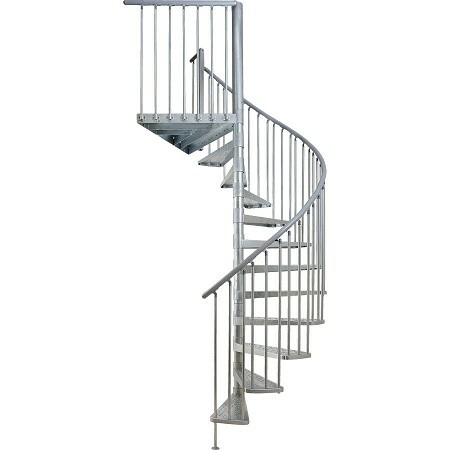 Spiral and helical staircases are ideal where space is tight and you want to use a minimal amount of material. The main materials are wood and metal, especially aluminum, and the spiral can spiral clockwise or anticlockwise. The stairs have a width of between three and six feet, and for safety reasons, it is not recommended to have stairs that are narrower than four feet. There are few significant design options for spiral and helical stairs. The spiral staircases are relatively easy, quick, and cheap to install. They are, however, steep to climb and can be unsafe for young children, the elderly, and infirm persons to use. A fall from the top landing could be more severe as the roll ends a long way down at the basement landing, resulting in more severe injuries than a fall from the other types of staircases. A ready-made, metallic, basic, and 3¼ foot spiral staircase costs about $500 from Boston Design, $700 from Stairways Incorporated, and $400 from Spiral Stairs of America. Completely built spiral staircases are stronger and more durable than knocked down kits. A simple and small knocked down steel kit costs from $400, or about $100 cheaper than a completely built unit. However, an aluminum staircase costs significantly more, starting at $1500. Larger staircases cost from $2000 to $5000. Comparative costs include the Dolle Bercelona Spiral Staircase at $1130, Dolle Rome Modular Staircase Kit at $1290 and Dolle Graz Modular Staircase at $900. Circular stairs are usually built in the house during construction. A.J Stairs builds pre-assembled units that can be installed within an hour, while Duvinage builds knocked down kits in three or four units. The circular stairs take up more space, are heavy – requiring the services of a crane to lift them – require a skilled contractor to install, and it is necessary to have a carpenter build a curved wall after the stairs have been installed. Consequently, circular stairs are quite expensive to build. The choice of material depends on several factors. You may want to create ambience and harmony with the basement setting, in which case you will choose a material or finishing that adds to the appeal of the basement. The external climatic conditions may have a big impact on the basement stairs just as it does on the basement space itself. For example, heavy rains and cold conditions outside that encourage dampness and moisture leakage will cause rotting of the wood, growth of moss on wooden surfaces and warping as the wood soaks in moisture. It may therefore be necessary to first address the climatic factors first by moisture proofing. Such measures add to the cost of the staircase. Generally, steel makes the cheapest building material for staircases, especially spiral staircases. The all-aluminum staircases are expensive to build and require galvanization or treatment of aluminum with molten zinc. Both aluminum and zinc are expensive materials, so is the process of galvanization. The preferred material for most staircases is wood, which is fairly cheap in raw form, but made more expensive by intricate designs. Wood requires treatment against rotting, warping and mold formation. 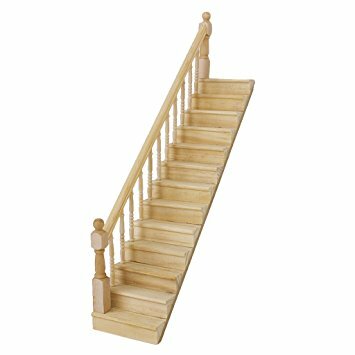 Wooden treads and risers are the most used materials for stairs because they are sturdy, relatively cheap and easy to design, and act as insulation against cold, hard basement floors. Treads and runners cost at least $200 per standard set of 15 units. A less popular choice of basement staircases is stone, brick, and concrete. These materials become cold and slippery during the winter season, and moldy during the summer season. They therefore require water proofing of the staircase, or at the very least of the treads, before finishing with insulation and carpeting. The measures will add several hundred dollars to the final cost of the staircase, which according to Owens Corning, is about $50 – $70 per square foot or about $600 to $1000. The average homeowner spends between $1000 and $3200 on materials for the basement staircase. A combination of materials may also be used to create a staircase. For example the staircase may be made of concrete or bricks and covered with wooden treads and metal railings. A wooden staircase may have metal and glass railings and balusters. A set of decorative metal or wood balusters for the entire basement staircase costs in the range of $1200 and $1600, although the plain and functional designs may cost just $600. Transport charges depend on a number of factors. If you choose to buy the staircase in pre-assembled kit then you will pay a higher transport charge. The cost of transport of unassembled materials is lowest, of semi-built sections is more, and of completely assembled kits is highest. Complex stairs like L-shaped, U-shaped, helical, and circular staircases require specialized equipment like a crane to hoist them into place, which escalates the cost, and you may have to consider contracting an onsite contractor to build from scratch instead. A knocked down kit is cheaper to ship, but you will incur higher costs of labor for reassembling the kit. The savings in transport charges may be wiped out by the extra cost of hiring two or three handyman working several hours to reassemble the knocked down kit. A complete kit has advantages. It is easier to install and requires a minimum of tools, expertise, time and extra help to install. It also retains the structural strength of the factory finished kit. There are fewer joints, which minimizes rusting. Freight charges depend on the distance from the factory to your house and whether you are transporting pre-assembled, semi-assembled, or unassembled parts and materials. The average cost of transport is $300 to $600. There are specially designed vehicles for carrying prefabricated units and knocked down kit staircases which charge a higher fee to use. Heavier staircases or materials, such as straight staircases cost more to transport than smaller and lighter units. 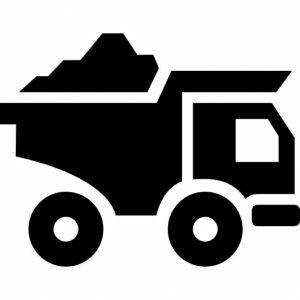 Transport charges are based on distance from the supplier to the premises and how delicate the cargo is. The cost of transporting a completely built unit ranges from $160 to $400 within the state. If the staircase requires a specialized machine to lift it into place, then you have to also add the transport charges for that machine as well, which may range between $500 and $2000. 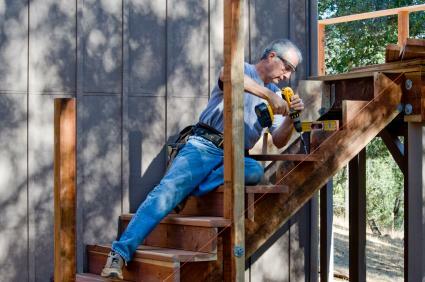 Staircase installation or building is labor intensive work. You can choose the type of labor from among professional contractors, hired handymen, or choose to go it alone as a DIY. Contractors are expensive to engage but you are guaranteed a professional job and expert advice. They normally charge a flat fee of between $1000 and $3000. Going it alone saves you money but you will take a long time to complete the construction and may not do as good a job as a contractor. However you will have the satisfaction of having done the job by yourself. Hiring handymen helps to reduce the time and effort it takes to build the staircase. Hired handymen will charge at hourly rates of about $45 per hour – the rate is higher in some states – which may add up to between $600 and $1200. For a simple installation and using the most uncomplicated materials, it would be necessary to have at least two carpenters working for eight to ten hours and paid at the industry standard of $45 per hour. The cost of labor would therefore be at least $900. If you hire them to demolish the old staircase, then expect to pay an extra $400 to $2000 for demolition and recovery exercise. Therefore if you are the do-it-yourself or skilled type of person you can save approximately $1100 on labor charges for building your basement staircase. Some states impose strict regulations on how you can modify your house, including the basement, and use construction permits and inspection licenses to regulate home modifications. Local taxes may be applied to home improvement or modification, raw materials and prefabricated units, and transport. The minimum hourly rate is also state regulated, and varies from state to state. In addition, some states require the job of building the staircase be carried out by a registered contractor. Your state may therefore create additional charges to building your staircase. The bigger a staircase is the more materials and other cost factors it requires. Generally the cost of a spiral staircase increases by 10 percent for every half foot increase in width of the treads and risers. Bigger staircase units are also heavier and more delicate to transport, therefore they are charged at a higher rate per mile transported. Large ready-made staircases require heavy duty machines to hoist them, and that adds to the cost. If a large staircase is built by a contractor on site, it would cost more in labor charges. The basement staircase is designed according to the desired staircase style. Although basements are often built plainly, they can be enhanced by using appealing designs of the balusters and newel posts. Wood is easier to design using a lathe machine compared to metal, which has to be welded together. Designing patterns is expensive and the more elaborate a design the greater the final cost of the staircase. The stairs can also be designed to include a carpet on the stairs. For most people the stairs into the basement are simply functional, but even these have some level of design features. The choice of plain wood is the cheapest option although less appealing to the eye. The appeal of the staircase can be improved by adding a carpet or tiles on the stairs. Intricate patterns cost a lot more, so many home owners settle for simple but elegant designs. Designs are done by specialized machines or processes, leading to major price adjustments. In fact, the main reason for price differences in staircases is the aesthetic designs, which can easily double the cost of the staircase-building project. The cost of additional design features is anywhere between $200 and $3000. The cost of rails and handrails depends mostly on materials used and the design. Rails and handrails are built for safety and support rather than for aesthetics, and are mandatory according to some state building codes. Rails are usually made of wood or metal, but sometimes from glass. Wood is strong and stylish, metal is cheap and strong. 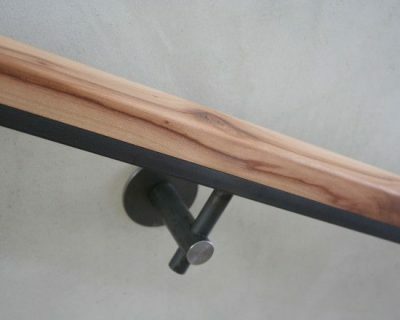 The handrail is about 3¼ feet high and can withstand a force of 200 pounds. Handrails should give a good grip used. The balusters leave a gap less than four inches in order to safeguard against children getting stuck between them. Wooden materials are popular because they can easily be designed and finished to an appealing look. Glass is not a suitable material in a rustic place like the basement. Plain Rails and handrails cost in the range $330 and $600. Light is essential for a safe and healthy environment. Natural light suppresses mold and mildew. Like the rest of the basement, the staircase needs natural lighting, which might require that you modify the basement space as well, and significantly increase your budget. For artificial lighting, you can either retain the existing setup or make changes that best suit the new staircase. Usually, it is advisable to leave electrical work to the experts, as the risk associated with electrical faults is too high and damage is too costly to recover from. Lighting can be placed along the wall, on raised newels, or tacked behind the risers for an elegant effect. A simple rework of the lighting will cost approximately $250 to $400. 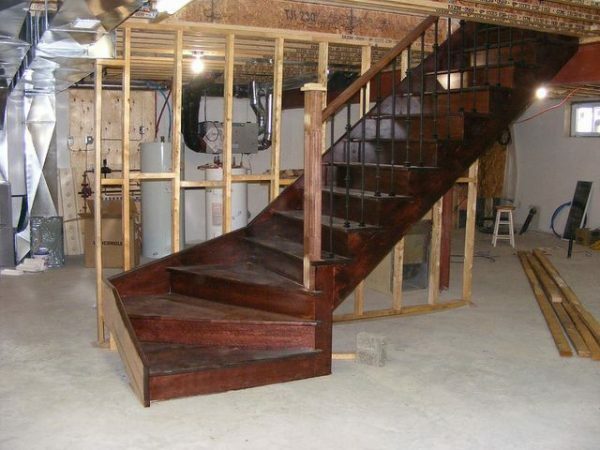 To complete the building of a basement staircase, it is necessary to do finishing touches. For a concrete floor, it might be necessary to insulate the floor and add place a carpet to protect users from the cold hard cement. A carpet keeps the floor relatively warm and aesthetically appealing, and cushions users from accidental falls. However, carpets are not appropriate in a neglected or underutilized basement as they tend to collect moisture and dust that result in dampness and molding. Carpets cost approximately $20 or more per square foot. A cheaper and more practical alternative is to install a carpet runner using a heavy duty stapler. Carpet runner cost less than $10 per square foot. Vinyl has become popular in basement finishing because it is cheap , has appealing patterns, is waterproof, and easy to replace. Wooden treads and risers, and all rail and handrails can also be painted in your favorite color. Paint is easy to apply as a DIY project, but the paint job has to be redone occasionally over the years. For a more durable paint job, you can use a latex-based paint, which is more expensive. Paint gives a pleasant color scheme to the otherwise dull staircase. Stain preserves the wood grain and retains the natural, authentic look of the wood. The cost of painting or staining hovers around the $100 to $150 figure. The staircase may need to be insulated from the elements. A carpet minimizes the risk of a nasty fall through slipping. A full length carpet and it underlying water proofing will cost approximately $200. The wall on which the staircase is fixed is painted over again at a cost of about $70 to $120. You need an electrician to do the electrical wiring for the staircase and reconfigure the lighting scheme at a cost of between $250 and $400. Start by measuring and cutting out the stair patterns on the stringers, and fix them to the wall and supports. Built the upper landing and work your way downwards. Apply glue on the contact surface between the treads and stringers in order to improve the grip, and nail each riser and tread on the stringer. Install the newel posts at the top, middle and bottom of the staircase. Attach the rails to the newel posts. Measure the intervals and drill baluster holes in the rails. Apply glue at tips of the balusters and twist them into the baluster holes. Add molding if need be. Installation of the main staircase takes three workers a full day’s job to install. The cost will be at least $600 for the handymen.